just in time for the Bank Holiday weekend! Promoter: spoiltpig, Denhay Farms Ltd, Devonshire Road, Heathpark, Honiton, Devon EX14 1SD. 1. The promotion is only open to residents of the UK (England, Scotland, Wales and Northern Ireland) aged 18 years or over, excluding employees of spoiltpig, Denhay Farms Ltd (the “Promoter”), their families, agents or anyone professionally associated with this promotion. 2. No purchase necessary; however access to the internet and a valid Facebook, Twitter, Instagram or Pinterest account is required. 3. Entries must be received between 00.01am on 16th May and 11.59pm on 22nd May 2016. 4. You may only enter once into the promotion. 5. How to enter: Log into your Instagram, Facebook or Twitter account, or visit www.spoiltpig.co.uk. Comment on what your ideal picnic moment is/was/could be, or share a picture if you’d prefer. You must include #spoiltpig within your comment. 6. 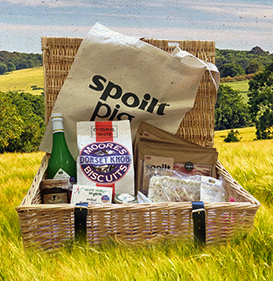 At the end of the promotional period, 7 winners will be selected and each will receive a spoiltpig true taste of the south west hamper containing 1 pack spoiltpig smoked back bacon, 1 pack spoiltpig unsmoked back bacon, 1 pack spoiltpig smoked streaky bacon, 1 spoiltpig smoked gammon steak, 1 spoiltpig unsmoked gammon steak, 1 bottle Four Elms Fruit Farm Cox/Bramley apple juice, 1 pot Natural Vitality organic smoked hummous, 1 coconut and lime Farleigh Road Farm Shop cake, 1 spoiltpig tote bag. 7. There are a total of 7 true taste of the south west hampers to be won. 9. The seven entries which effectively meet the judging criteria above as decided by the judges will win the prizes. 10. The winners will be contacted via a public and private message on Facebook, Twitter, Instagram, Pinterest and at spoiltpig.co.uk, on their entry with instructions on how to claim their prize within 24 hours at the end of the Promotional Period. Entrants are encouraged to monitor their Facebook, Twitter, Instagram and Pinterest accounts during this period to check if they are a winner. Winners then need to confirm they would like to accept their prize by following the details on the public message within 24 hours of notification, sending their address details via private message. 11. Please allow 48 hours for delivery of the prizes. 12. Prizes will be delivered to all winners who communicated within the above mentioned time frame, by Saturday 28th May 2016. 14. The prizes are non-transferable and non-exchangeable and there is no cash alternative in whole or in part. 15. Prize winner agrees to their name being used for promotional purposes and/or to take part in publicity and by entering, the entrant agrees that spoiltpig may publish entries on the spoiltpig website and on their social media channels. 16. The full names and counties, plus the winning entries will be available by sending an email to < ahref="mailto:[email protected]">[email protected] for a period of 1 month following the relevant weekly closing date. 17. Factors outside the control of the Promoter may interfere with the operation of Facebook, Twitter, Pinterest and Instagram. The Promoter does not therefore guarantee continuous uninterrupted or secure access to Facebook, Twitter, Pinterest and Instagram. 18. Incomplete, illegal, misdirected or late submissions will not be accepted. Proof of sending will not be accepted as proof of delivery. The Promoter takes no responsibility for entries delayed, incomplete or lost due to technical reasons or otherwise. 19. Instagram, Facebook, Twitter and Pinterest do not sponsor, endorse or administer, and nor is it associated with, this Promotion. 20. Bulk votes or entries made from trade, consumer groups or third parties will not be accepted. Incomplete or illegible entries, bulk votes, votes by or via third parties or syndicates, entries by macros or other automated means (including systems which can be programmed to vote), and entries which do not satisfy the requirements of these terms and conditions in full will be disqualified and will not be counted. If it becomes apparent that a participant is using a computer(s) to circumvent this condition by, for example, the use of ‘script’, ‘brute force’, masking their identity by manipulating IP addresses, using identities other than their own or any other automated means in order to increase that participant’s entries into the draw in a way that is not consistent with the spirit of the promotion, that person’s entries will be disqualified and any prize award will be void. 21. The decision of the Promoter is final in relation to all promotional matters. 22. If for any reason the Promotion is not capable of running as planned for reasons (including but not limited to tampering, unauthorised intervention, fraud, technical failures or any other causes beyond the control of the Promoter which corrupt or affect the administration, security, fairness, integrity or proper conduct of this promotion), the Promoter reserves the right (subject to any written directions given under applicable law) to disqualify any individual who tampers with the entry process and to cancel, terminate, modify or suspend the promotion. 23. If an act, omission, event or circumstance occurs which us beyond the reasonable control of the Promoter and which prevents the Promoter from complying with these terms and conditions the Promoter will not be liable for any failure to perform or delay in performing its obligation. 24. The Promoter reserves the right to cancel or amend the prizes available at any time without prior notice if circumstances make this unavoidable. 25. To the extent permitted by law, the Promoter shall not be liable to the winners for any loss or damage whatsoever caused (whether in contract, tort (including (without limitation) negligence), statutory duty or otherwise) arising out of or in connection with the promotion and prize. 26. In the event of any dispute the decision of the Promoter is final and no correspondence will be entered into. 28. These terms and conditions and any issues or disputes which may arise out of or in connection with these terms and conditions (whether such disputes or issues are contractual or non-contractual in nature, such as claims in tort, for breach of statute or regulation or otherwise) shall be governed by and construed in accordance with the laws of England and Wales. Entrants hereby irrevocably submit to the exclusive jurisdiction of the English courts to settle any such dispute or issues.